Here are some facts about the Isle of Wight. 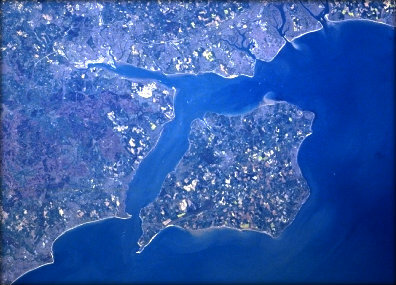 The Isle of Wight is England’s largest island. It is located in the English Channel about 6km from the mainland, and separated by a body of water called the Solent. The island measures about 380 square km, of which about half is an area of outstanding natural beauty. About 140,000 people live on the island and several million people visit each year. Queen Victoria had a holiday home on the island, and the island also attracted poets and artists during the 19th century. In 1897 the world’s first radio station was established there. The island was heavily bombed during World War 2. A fuel pipeline was laid under the sea to the island, and sections of it can still be seen today in a small museum. One of the most popular natural attractions is the Needles, a row of 3 chalk stacks in the sea. The 33 metre high Needles lighthouse was built in 1859. The island is home to many rare animals and plants and is sometimes called the Garden Isle. There are many red squirrels which have been driven from the mainland by the grey squirrel. The island is one of the best places in Europe to find dinosaur remains. A 9 year old local girl recently had an undiscovered species named after her. In 1812, the first Cowes Regatta was held. Helped by the attendance of the Royal family, it has become the largest international yachting event in the world. The Isle of Wight is often said to be the most haunted island in the world, perhaps due to mysterious ley lines under the island. It attracts thousands of ghost hunters every year. There is an Isle of Wight county in Virginia, US, and the county town has the same name. The town was founded during the 17th century by settlers from the island.